Bewley's Cafes are very much part of the Dublin scene. Enjoy excellent coffee and a stickey bun from the bakery after shopping!! 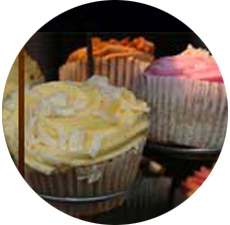 Breakfast & pastries daily, carvery lunch or snack during the day or a la carte dining each evening. Great selection, good value and good service. Takeaway Coffee from 07.30, daily. 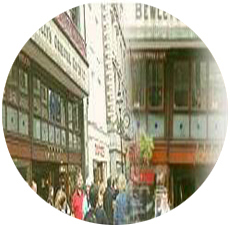 ne of the most famous cafes in Dublin are the Bewleys Cafes on Grafton Street. The cafes are famous for their ambiance. The quality of their food is variable. However, certainly worth a quick tea, coffee or glass of milk. Bewley's is a multi-million pound Irish success story. Like many other Irish success stories, the Group has expanded into the international arena. Bewleys is the market leader in ground coffee in Ireland and you can enjoy Bewleys teas and coffees in hotels, cafes and restaurants all over Ireland, as well as enjoying the unique Bewleys taste at home. Bewley's Cafes are very much part of the Dublin scene. Over the years the central figure among the large staff was Victor Bewley who moved about staff and customers with a welcoming smile and gracious courtesy. Bewleys is a well known landmark and regular haunt of budding artists, writers and the young and famous. All three locations in the city are very popular meeting places for locals and visitors alike throughout the day. Enjoy excellent coffee and a stickey bun from the bakery after shopping!! Breakfast & pastries daily, carvery lunch or snack during the day or a la carte dining each evening. Great selection, good value and good service. Dublin and Bewley's, the chain of cafes founded in 1840, are inextricably linked. Locals and visitors alike still revel in the smell of roast coffee and the delights of the sticky bun in Bewley's cafes, especially at Grafton Street and Westmoreland Street. A small area on the first floor of the Grafton Street cafe, which once housed Bewley's chocolate factory, has been turned into a museum, with family portraits, old equipment, teapots from the 1920s and even an old one-penny lavatory lock. With the large, bustling tea-rooms, Bewleys was the perfect place for writers to come in and observe their fellow Dubliners taking a break, meeting friends and lovers and of course, drinking tea and coffee. Brendan Behan, Brian O'Nolan and Patrick Kavanagh were three famous regulars in the '50s, although those three renowned drinkers were probably there to sober up, rather than do any serious work. Steeped in local history and folklore, Bewley's Cafes are a Dublin institution. The surroundings in the older premises (Westmoreland Street and Grafton Street) are glorious-old wooden paneled rooms, stained glass, vast coffee canisters. The banquettes are miraculously comfortable when you're settling in with your daily paper. This Dublin institution is open from breakfast time onwards. Its breads, pastries and home-made soups are superb. Mackerel at 'Bewley's Building' is Dublin's fish restaurant, serving stunning food with a distinctive Irish flavor. Mackerel's beautiful yet relaxed environment is housed in the famous Bewley's building on Grafton St - heartbeat of Dublin for generations. 'any new fish restaurant is a thing to be celebrated, especially one that offers classic quality as well as originality in its cuisine... a fish eaters Shangri-la is now open. the mussels were big and beautiful and vanished with considerable speed.....they were quite perfect. the smokies are a delight you all should savour. the haddock......produces a dish for kings and queens everywhere. the dessert...a quite and amazing lemon mousse. Please arrange booking by calling us on the phone. Cafe Bar Deli was founded in 2001 on the principle that great food can be served with style at reasonable prices. Cafe Bar Deli is proud of its pizzas, pastas and salads. They are the best in town. "...the food is good, the dishes have broad appeal and the prices are competitive... friendly, efficient and enthusiastic (service)..."
and good value for your money... the pasta was truly excellent cooked perfectly... I stopped talking and cleaned the plate"
Mezzanine is the coffee and pastry place - a great place to see and be seen, to meet and greet, to eat. The Mezzanine's is housed in the famous Bewley's Cafe on Grafton Street, where you can drink coffee roasted on site. Bewleys Cafe Theatre is delighted to announce the return of evening entertainment to its Grafton Street home. 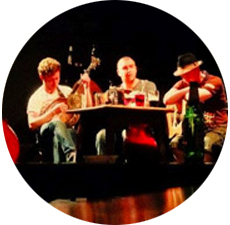 Revamped, redecorated and sporting a brand new piano, Dublin's most intimate venue offers a rich variety of jazz, blues, folk, cabaret and comedy, under the banner 'Live at the Oriental Room'. 10 Westmoreland St., Dublin 2.